Community Q&A Question: Horse power gain? Hi I have a 90 gt 306 E303 cam ford racing hydrolic lifters powerdyne supercharger 6lb gt40 lower intake & upper tube intake. 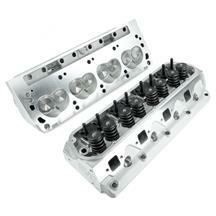 I currently have SVO aluminum heads. I wish to have a pair of heads that can produce 65 real horse power & better for a daily driver. NOT for the strip. Of course lowest price lol. Thanks for your help. I'm not sure what the SVO heads flow so I can't give you an accurate answer as to how much gain you will get with your set up. These heads flow very close to the same numbers as the AFR 165 and Trick flow 170 Twisted wedges so i believe you will gain some but I have no way of gauging the number gain.